Since the weather forecast predicted a nice Saturday and a stormy Sunday, we spent this past Friday evening kicking around some ideas for outdoor activities for the first half of the weekend. When we called this morning about a Tar River tubing trip that looked fun, it turned out that Griff didn’t meet the age requirements. 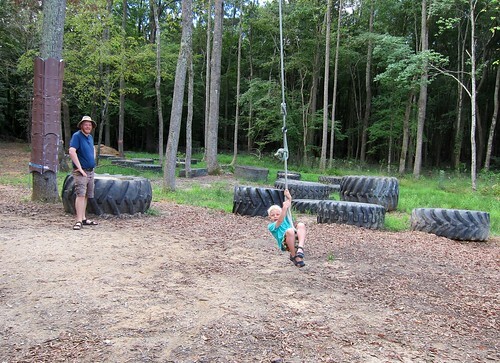 After scrambling around for a Plan B, we hopped into the car and headed to Go Play Outside Now, a private outdoor playground near Garner. 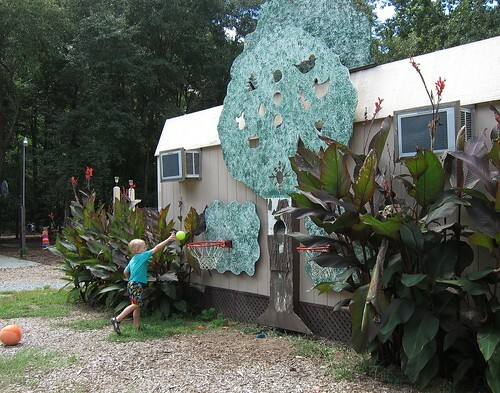 Go Play Outside Now is similar to Three Bears Acres in that they’re both spacious semi-wooded areas with natural play areas, slides, water activities, etc. GPON doesn’t take credit cards, which we only found out about on arrival. Luckily there’s a nice gas station just up the road with a CashPoints. The gas station is also a good place to grab some last-minute snacks, since there are no food concessions at the park (but bringing in outside food is fine). GPON is significantly cheaper than Three Bears at $5/person for 2 hours or $10/person for all day. We chose the latter option and ended up staying for 5 hours or so. We all had a great time. 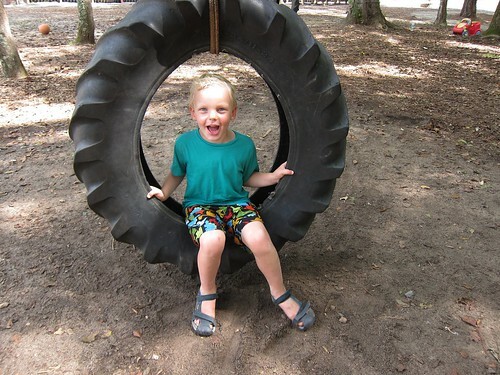 There were rope and tire swings, a huge sandbox area with kiddie pools and a volleyball net, a play campground, a basketball court, swingsets, climbing structures, teepees to hide in, and a large laser tag area that will interest Griff when he’s a little older. There were lots of shady picnic tables for eating and resting. For us, though, the big attraction was the slides. 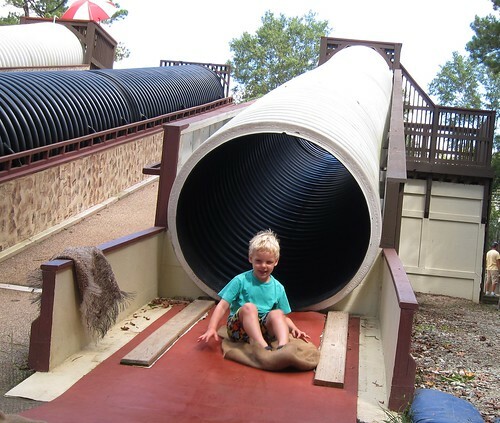 There were two dry tube slides with burlap sacks to slide down on, and a third slide that operates as a water slide during the summer. The water slide requires 2 staffers to run, and is open intermittently through the day (laser tag is going on while the slide is closed). 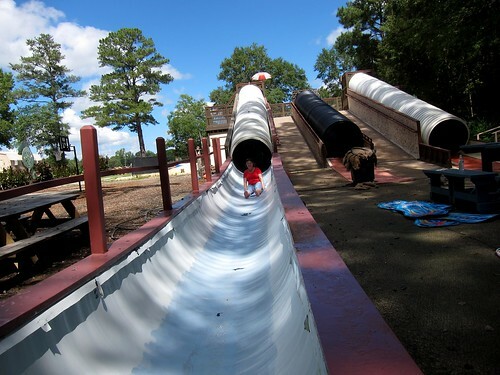 The dry slides were great. The water slide, though, was awesome. 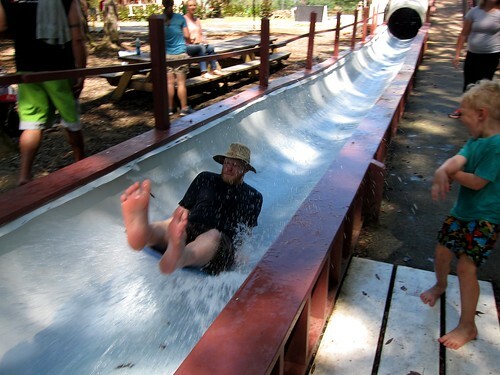 There’s a no-swimsuit rule in the park, so you have to ride the water slide fully clothed (but barefoot). Luckily, we had brought extra clothes for everyone. As you might guess, the heavier the rider, the faster the ride and the bigger the splash at the end. 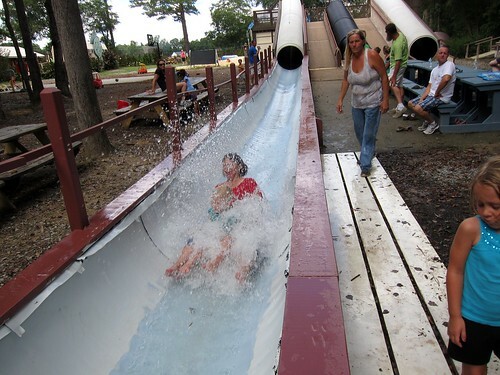 When there was a kid riding with parents, the splashes were huge. We really liked this place. It was clean and well-maintained. There were real bathrooms instead of portapotties (with A/C, aaahhhh), and the staff (mostly the family that owns the property, I think) were all extremely nice. Unlike Three Bears, which is out in the middle of nowhere, GPON has gas stations, restaurants, etc within a mile or two. There were at least three birthday parties going on while we were there, and it didn’t seem at all crowded. We’ll definitely be back.